After its founding in 1905, one of the earliest uses of this famous San Francisco park was as a refugee camp for hundreds of people made homeless by the devastating earthquake and fire that nearly leveled the city a year later. Sloping up the hill from the historic Mission Dolores, San Francisco’s oldest structure, this park has continued to serve the diverse needs of the dense Mission district for more than one hundred years. While the refugee camp is long gone, Mission Dolores Park now plays host to weekend barbeques, pick up tennis matches, and of course, an ever-changing motley pack of city dogs. The views of the San Francisco skyline from Dolores Park are among the best from any dog park in the city, and the generally sunny Mission-district weather make this a perfect park for summer picnics where your dog can run free. Much like a bigger version of Alamo Square Park, Dolores Park is essentially just a large sloping expanse of grass; so don’t come here expecting to get a good workout hiking trails. And without a lot of things to explore, your dog will undoubtedly find that the other dogs in the park are the biggest attractions. 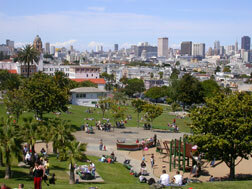 Dolores Park is located in the Mission District between Church and Dolores, and 18th and 20th Streets. There’s no parking lot for the park, and street parking in the area can be difficult. While there are several posts where you can find plastic bags, it’s a good idea to bring your own and leave any that you don’t use behind. Since this is a high-traffic park in a dense neighborhood, it’s important that you keep a close eye on your dog and maintain control at all times. See our “Dog Park Tips” page for more advice.